Ten years ago at just about this time, I was on this self same island of Cozumel for a week. All my daiquiris were virgin that trip since I was pregnant with the firstborn child who was – would become – Grey. I took refuge in the buoyancy of the water. And we read. A lot. But since then, our reading vacations have been stolen moments (pretty much all during Camp Gramp week). Sure we might sneak in a paltry four or five books on a vacation, but nothing like the epic conquests of yore. Children – especially young children – require slightly more attention it turns out. This time, though, they’ve only spent a few hours there. The only thing nearly as fun as snorkeling along the reefs with my beloved – pointing out the octopus and lionfish and barracuda – is snorkeling along the reefs with my beloveds. Grey has become a fine swimmer and can almost dive with the snorkel. Thane – indomitable Thane – arrived barely swimming and has improved by leaps and bounds since. 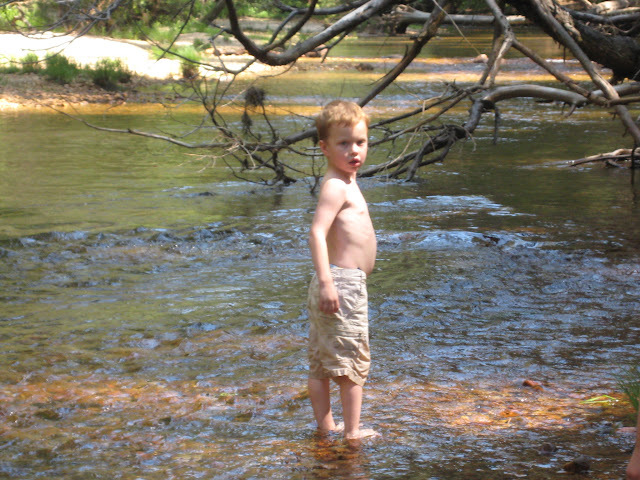 He insists on swimming (even though he really can’t) and calmly keeps paddling even as the waters close in over his head. He’s unflappable. Add a life vest, and he was perfectly content to come snorkeling with us – even letting go of my hand to go investigate some interesting formation. How much more fun things are when I can do them with my children and yet find them fun for me!! Then, yesterday, my life changed forever. I think that may not be an understatement. Thane is in Kindergarten. He has a gift of great focus. He always has – he could do a hundred piece puzzle at three through sheer determination and patience. (Certainly not through optimal strategic choices, assuredly.) The door to reading has finally opened to him. He has many needed words by sight and strong phonetic skills. He still struggles to blow past words he doesn’t know, but he has three of us standing by to tell him that e-n-o-u-g-h is enough. “Mom” he asked. “Did you bring me any chapter books?” I handed him “A Horse and His Boy”. He gamely worked his way through the first pages. “Mom, do you have anything easier?” Well, no I didn’t. But what I did have is the wonder of technology. I LOVE my Kindle, in part because it means I don’t have to pack an entire suitcase of books. (Yes. We did regularly bring a suitcase for the books and board games.) I just got a new Kindle (backlit, with 3G downloads so I don’t need wifi to buy the next book in the series) but I brought my old Kindle with me in case. In case of what I’m not sure, but in case. I downloaded Books 1 – 4 of the Magic Treehouse and handed it to him, showing him how to turn the pages. We went to breakfast. And an hour later, he was begging for more time. He’s plowed his way through the first three and a half books (as well as a non-fiction book on Jupiter his dad bought him.) We all sat – at breakfast, in front of the pool, in the beach chairs, at dinner – all reading our books together. It was GLORIOUS. The world has opened up before us, of the quietest and most profound adventures. Then, as though my heart was not already filled to brimming, my eldest. My beloved. That child I carried with me as a promise ten years ago… started reading Narnia. I read him the first few chapters of “The Horse and His Boy”. (Personally, I think “The Lion, The Witch and the Wardrobe” is one of the weaker Narnia books. And “The Horse and His Boy” stands alone best of the rest of them.) He finished. And asked for more. Yesterday he read “Prince Caspian”. Today “The Lion , The Witch and the Wardrobe”. At dinner he downloaded and started “The Voyage of the Dawn Treader”. There once was a boy named Eustace Clarence Scrubb, and he almost deserved it. Those books were my gateway to this wondrous world, my friends. They initiated me in the arts of the fantastical. I remember the realization crashing on me that ASLAN was like JESUS. (How much more precious is an allegory when discovered by a reader instead of explained!) It was a short hop for me from Lewis to his dear friend Tolkien. And that’s a world my imagination has never fully left behind. This marks, I think, the beginning of a new phase of my life. I have long left behind parenting babies. My feet are crossing over from parenting young children (that stage where your greatest wonder is how the heck you’re going to keep them entertained so you can do things). I enter through the doors of parenting all elementary children. Already I can sleep in. Already they dress themselves. Grey puts on his own sunscreen – hallelujah. And now, my sons will begin to go on the greatest adventures between the pages of books. Some they will share with me. Others they will venture on alone. But their journeys have begun. It’s a great question why any of us choose to have children, in this age. We don’t need them for their labor. We no longer expect children to provide for parents in old age. We aren’t allowed to use them for spare organ parts. Kids are tremendously expensive, and an iffy proposition since it turns out their eventual success is much more about their efforts than ours. Having kids comes along with a burden of bearing others’ judgements, not sleeping in, cleaning up vomit, worrying and making excellent meals that no one will eat. And yet we continue to have children. If I thought about why I wanted to have children, other than just seeming like the thing I ought to do, I think I wanted children so that someone else would get to enjoy childhood as much as I did. I thought back the the joys of my youth and wanted to offer them to someone else. I remember in particular one car trip we took as a family. (My family practically grew up in a car.) 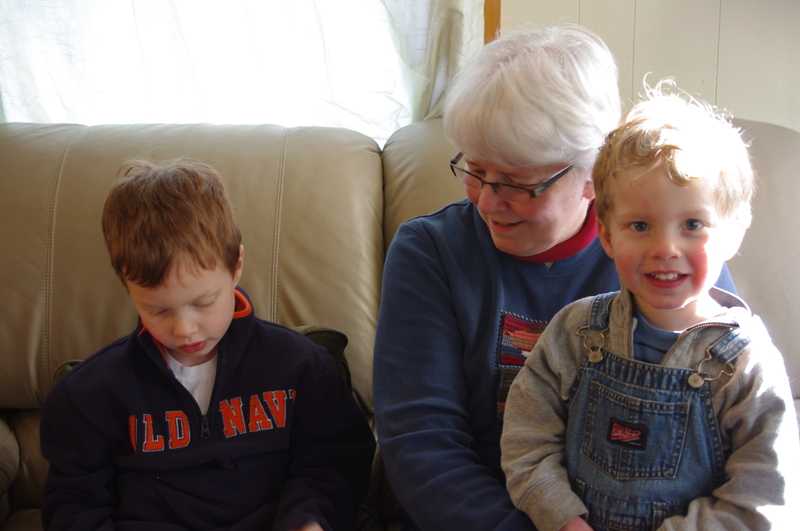 My brother was a nascent reader – maybe four or five. My sister and I – eight and six years older – were already well versed in reading. On this particular day we drove through the rolling desert hills of Eastern Washington and told my brother about all the books we were jealous that he’d get to read for the first time: Mrs. Buncle’s Book, The Lord of the Rings, Shakespeare. My entire family breathed a deep sigh of relief when my brother finally picked up books and started reading along with the rest of us. We spent our vacations with book bags larger than our clothing bags. I married a man with the same predilections. But the last decade or so has been somewhat lacking in the reading department. We’ve had a non-reader as part of our family for the last eight and a half years. Until now. Last night, we sat around the fire on an incredibly buggy night on the shores of White Lake. (Ask me about how I and my phobia survived my first ever tick bite!) Adam was reading some book of Cthulu horror on his Kindle. I had managed to lure Grey into reading “My Side of the Mountain”. 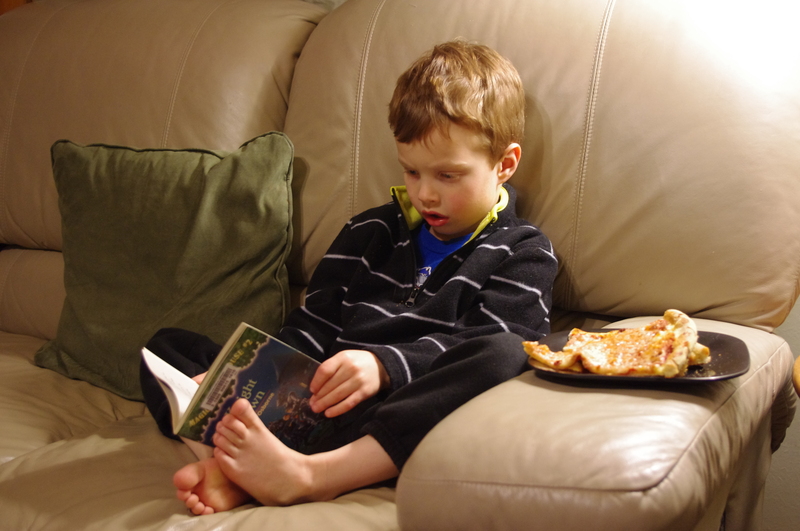 Ah – is there anything sweeter than watching your child devour a book you had loved as a child? He was deep into it, head dancing with dreams of living off the land, just as I did. And Thane was doggedly working his way through beginner books. He read “Are You My Mother” and “Put Me In the Zoo” and slogged his way through a Pokemon book. For an hour or so the four of us sat around the campfire swatting mosquitos and reading. The joys of slightly older children did not stop there, though. Finally chased into the tent by the ravening hordes of starving, blood-sucking insects, we broke out a board game. On the tent of the floor, we played through an oddly cooperative round of Carcassonne – an actual game that Adam and I play for fun. Thane played a tough game, and Grey actually won. Then we read some more before bed. Thane tired before he finished his book, and I woke up to the sound of him slogging his way through it in the morning light (at a reasonable hour). This Memorial Day camping trip was wet, but dryer than last year. It was cool, but warmer than last year. (Actually, Friday night was one of the best night’s sleep I’ve had in a long time.) It was irredeemably buggy. But it felt like the dawning of a new age, with the company of these cool kids who like to build forts, imagine themselves as outdoorsmen and sing old folk tunes in front of the fire. They can open the zipper to the tent, go to the bathroom by themselves and be safely out of my sight. In the buggy, moist air above the loons of White Lake I had that moment of joyful realization: this is why I had children. You can see all my pictures for May, including video of Thane reading, by clicking here! Last night I went into a darkened room, as I do pretty much every night I am home, and I kissed a pair of boys good night. I climbed under Grey’s bed to the inviting cubby where Thane has been sleeping since Tiberius took over Thane’s room as a sick-room. In that darkened corner was my four year old (for another five minutes), his hands clasped as though in prayer, lying with an already beloved birthday book next to him. I kissed his forehead. He still sounds like a baby when he sleeps. But that’s all the baby there is left to Thane. As he comes into his fifth year, he comes into his own. Thane has a tremendous sense of purpose and drive, and a deep commitment to his beliefs and ideals. This was somewhat… trying… this year as his beliefs and ideals often included things like “Not going to school” or “Making sure you heard him about what he thinks he smelled in the middle of church” (hint: it’s never good). I have consoled myself through some of his more adamant moments by reminding myself that some traits that are very difficult to parent at four are pretty awesome in an astronaut or CEO or Nobel-winning-scientist-who-is-too-stubborn-to-give-up. Thane’s favorite time is tickle and snuggle time. Thane’s personality becomes increasingly clear. His greatest gift is this remarkable spatial/color reasoning. He still loves to do puzzles (he tops out around 100 pieces because he has no strategy) and create symmetrical creations with shapes on our kitchen wall. However, now that he can force his fingers to obey his will better (he’s been frustrated by their lack of obedience for years) he’s really stepped up his game with Legos. For his birthday, I got him a Lego set rated for 8 – 12. I kind of figured his brother would help him. Instead, Thane did the Entire. Thing. By. Himself. I helped him find like two pieces he lost, and put on a few of the stickers. His smile cheers me up every time I see it. Thane is very innovative in how he puts his Legos together. He tends to develop more three dimensional creations than his brother. He does love minifigs best, and will often assemble armies of 20 – 30. His preschooler hands undo his work nearly as often as they finish it, but he persists until he matches his mind’s creation. Just for the record, Thane’s drawings and artwork are pretty normal – he seems pretty uninterested in drawing/coloring in general. Thane, with the Golden Ninja Lego set. When not engaged in feats of spacial reasoning, Thane loves rough-and tumble play. His favorite thing in the whole world is “tickle and snuggle time in Mom and Dad’s bed”. He simply cannot get enough rough-housing, which would be more fun if his head couldn’t be categorized as a deadly weapon. He loves physical play. He’s been doing soccer for the last few weeks, and has done pretty well. With the advantage of a younger brother, he’s gotten to attend a few of his brother’s practices and last week actually did the entire practice with his fellow-four-year-old-younger-brother-friend. The future’s so bright – he’s gotta wear SHADES! Lately, Thane has been working very hard on learning to read. He has phonics down (except for period confusion between “b” and “d” – which come on, that’s hard.) His patience and diligence when he decides he’s going to read is astonishing. Just don’t let him corner you for “Hop on Pop” because that takes nearly an hour. Thane as a Skylander for Halloween. 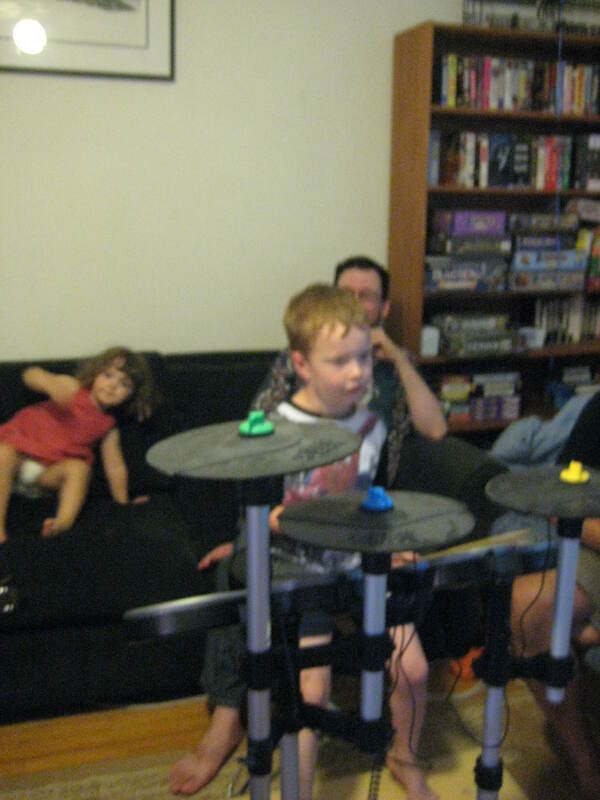 Thane loves Skylanders, even though he never plays – he watches his brother. He still loves Scooby Doo. He loves Digimon. He wants to be read stories about super heroes. He sings songs and makes up new words – and they’re often pretty good ones! He is constantly frenetic, and it is hard to get him to sit still for – say – dinner. But when he gets his focus on, he can sit quietly for an hour. He leads off practically every statement with “Guess what” and is desperate to get his points across. Sometimes he will insistently ask a question three times or four times, but fail to listen to all three answers. He can go across all the rings in the playground, hand over hand. He sleeps with his Puppy, worships his brother, and is 45.5 inches tall (91st percentile). Thane bounces when he walks. Thane still holds my hold. Happy fifth birthday, my beloved son. 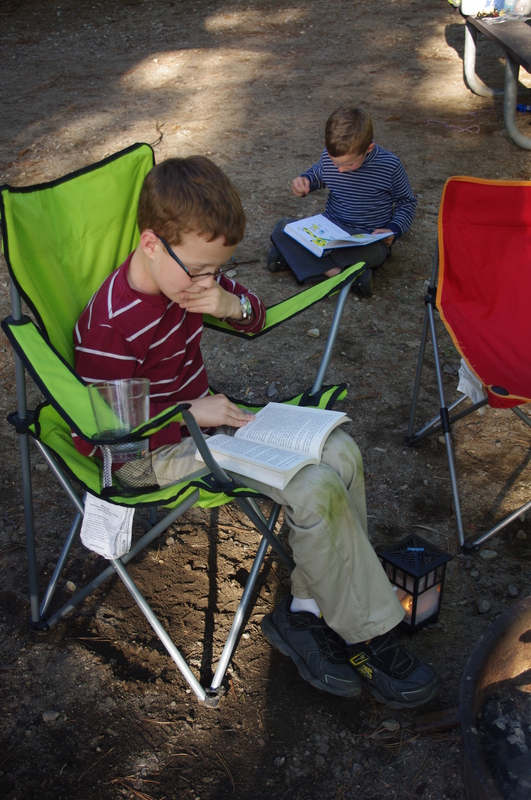 You can see an album of our family adventures in October here, including a video of Thane reading. If you want more Thane, here’s an album I’ve put together of some of his highlights this year! Beginning reader: Still no bookmarks. If interrupted, place picture book face down to preserve location. Use as roller skate when you re-enter the room. Grade schooler: Dog ear the pages of “The Lion, the Witch and the Wardrobe”. Go to furthest page dog-eared, since every second page is so marked. 6th grader: Use pink name-derivation bookmark your grandma gave you at Christmas, since your sister has threatened to dismember you if she ever catches you dog-earing her copy of “Watership Down” ever again. 9th grader: Intricately designed bookmark made with a black BIC pen, lined paper and tape… and the extra time granted to you by your American History class. This masterpiece now lives in my Bible, along with many of my other nice bookmarks. College student: Erudite Shakespearean quotes on reading and philosophy that you got out of Bartlett’s Quotations, spent hours looking for the perfect celtic clip-art for, and printed on resume paper. I thought I might find this in the Yale Shakespeare, but instead I found it in the Rodale Book of Composting. Go figure. Young Adult: Proper bookmark with nice but inobtrusive artwork that sits right by your bed for your regular use. Parent of an infant: No bookmark. “The Monster at the End of This Book” does not require a bookmark. It burns my precious! Obviously this is my current stage of life. Parent of college student $6 bookmark with logo of child’s school that you are paying $50,000 a year for. You paid for said bookmark at college bookstore while dropping child off. Empty-nester Limited edition signed artistic bookmarks created by the artist whose work you’ve been following lately. Grandparent Laminated picture of your grandkids being cute. And/or cats. What bookmark phases am I missing? Which phase are you in right now? What bookmark is in the book you’re reading right now? What’s your favorite ever bookmark? My husband is testing for his next kyu in aikido. This means that we pretty much won’t see each other again until Friday — at least not before 9ish. I was thinking about the library this weekend, after my son’s foray into chapter books and avowed interest in obtaining the second in “The Magic Treehouse” series. The library is like 3 blocks from our house. It has a pretty good children’s section. I went quite a bit while I was on maternity leave. But then over the summer they stop their Saturday hours… meaning that it’s really hard for those of us to work to go. And my Saturdays are so crazy anyway that it’s been quite a while since we went. But…. Monday they’re open late. I put together absent husband, late library night and new reader, and came up with awesome. I left Grey in front of the early readers while Thane and I went to the picture book room. Thane announced his intention, shocking as it was, to get books about Dinosaurs. Aren’t you surprised? I grabbed random dinosaury books from the shelves, creating a stack of paleontological masterpieces. When I found Grey, he had the next two Magic TREEHOUSE books and the next Stinky the Shrinking Kid book. (Which really IS too advanced for him, but he likes to read the comic parts.) We checked out. That, child is a fantastic idea. Posted on March 1, 2011 February 28, 2011 Categories Daily livingTags awesome night, library, reading3 Comments on Best. Night. Ever. So, Grey. Grey is almost five. If you ask him when his birthday is, he can tell you the date. He knows what day of the week it is every day, and what that means. He knows what month of the year it is, and what that means. He knows his brother’s birthday, and how old Thane will be, and will likely volunteer the information that when Grey is seven, Thane will be four. This is important because seven is the epitome of “grown up” and four, well, Grey is four so four is awesome! Grey will not being going to Kindergarten this week. I’ve been wrestling with this for over a year. There’s lots of “one the one hand” and “on the other hand” going on. 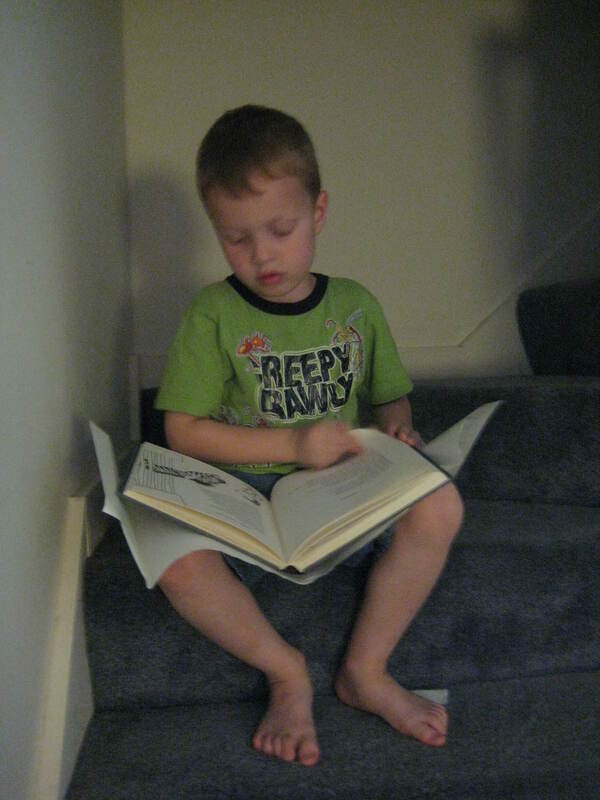 (The one hand is: he’s reading well, can count to 100 and is making light of his preschool curriculum. The other hand is: children tend to do well with an extra year’s emotional maturity before going to school, and Grey will be no exception. Also, he will spend the rest of his life as a big person… why rush it?) The third and final hand, though, is that there is no mechanism for testing in early and I don’t want to start him off in private school, so wait a year it is. I don’t think this will do him any harm. The reading. Oh, the reading! So Grey first read a book all by himself nearly a year ago, at his 4 year checkup (to the surprise of his doctor and I). He spent several months with the ability to read a word or two. It’s hard work, though, and he preferred to let us do the reading. Since he’s four, and he deserves to still have his mommy and daddy read to him, we praised his reading efforts, cursed when he read something inconvenient to us, and continued to read to him. But last night! My mother-in-law is here, so I have a few moments of this weird thing called “leisure”. Go ahead and look it up in the dictionary. I was using this precious commodity to read a book for work (hey, at least it was an interesting one). I asked Grey to read with me on the couch. First he read me the book “There’s a Wocket in My Pocket”. (Which, um, seriously. That’s not exactly easy. Do you know how many made-up words there are? He must have a decent grasp of phonics to do it, although he definitely uses rhymes to figure out the pronunciation of the nonce-words.) After that, I told him he had to read to himself. And so he got out a treasury of Little Critter stories and read THREE of them to himself. All by himself. His reading is sophisticated. He uses funny voices, when appropriate. There’s rhythm and cadence. He sometimes corrects my interpretations when I read aloud to him. He stops at punctuation. He misses words because he is reading for content. 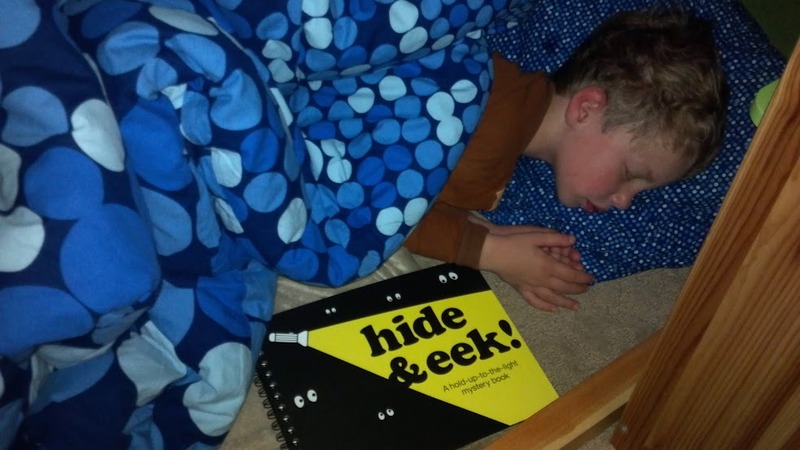 It took me a while to figure out that’s a sign he’s reading better, not worse. But a word might say “that” and he’ll read it “the” because he’s taking a holistic view of the sentence. It makes sense. It still flows. But it means that he’s reading sentences instead of words. (And hey, my mom still does that sometimes!) But reading for entertainment!!! Squee!!!! I bought him some new books to read this weekend while we’re camping. I hope we get him good and hooked. He’s starting to get a better grasp on his temper. Obviously one of the big components of that is getting more sleep. I need to keep reminding myself how much easier his life is when he gets to bed early, because I get lazy and enjoy his company and don’t always get him to bed with alacrity. But if you take away his toy unfairly, he might yell at you, “I don’t like that!” This may not seem huge, but it is. He’s using his words to work through very hot and present emotions. He’s making huge strides in mastering control of himself. There are still some challenges, of course, in Grey’s life. He’s a very picky eater, often turning up his nose at the delicious and laborious dinners I place in front of him. I find that hard to deal with. He has a tendency to be a bit emo… there are times when some black eyeliner and vampire-themed-clothing would not be out of place. He hates it when things don’t go perfectly his way. (Don’t we all?) We’re working on cutting out a nail-biting habit before it gets too ingrained. But if he was totally perfect, that would be annoying. Emotionally, Grey is getting very complex. We were in the car the other day, driving home from aikido, and he told me, “Mom, did you know some old people are sad because they didn’t have any children?” Whoof. Complicated social concepts to explain on no notice … GO! So we talked about how for some people that’s true, how some people don’t have kids and aren’t sad about it, and how other people choose to find other ways of having children, like adopting. I finally figured out he’d watched “UP” and really taken to heart that wrenching first 20 minutes. We talked about how that couple was both very happy and a little sad. Despite being a non-cuddly baby/toddler, Grey has turned into the world’s snuggliest preschooler. He often comes to hug me, give me kisses and snuggle me. He is very solicitous of my well-being, although he is also a big rough-houser. He’s getting big enough that we’re teaching him how to safely rough-house with us. But he is so gentle and kind, to me and to his little brother. And most especially to his two favorite animals du jour: Tigry and Puppy. They are his children. He’ll give you the complete family tree of all his stuffed animals, but they’re his favorites. He tells me, without provocation or priming, that he loves me very much and that I am his “Sweet mommy”. He is my sweet Grey.